Should I use Windows' Built-in Encryption? You can't effectively password-protect a folder without encrypting it. And strictly speaking, you can’t truly encrypt a folder, because a folder is not actually a container. It just looks like one to the user. The data comprising the files inside any given folder may be strewn all over the drive’s media. But there are alternatives. You can encrypt every file in the folder. You can put the folder into an encrypted .zip archive, or into an encrypted vault. You can effectively encrypt a folder with Windows’ own Encrypted File System (EFS)—at least if you have something more expensive than a Home edition of Windows. You need a Pro or Ultimate edition of Windows to get EFS. Just to clear things up, these versions of Windows have two encryption tools. EFS encrypts files and—in a sense—folders. BitLocker encrypts partitions and drives. To encrypt a folder with EFS, select Properties, click the Advanced button, and check Encrypt contents to secure data. 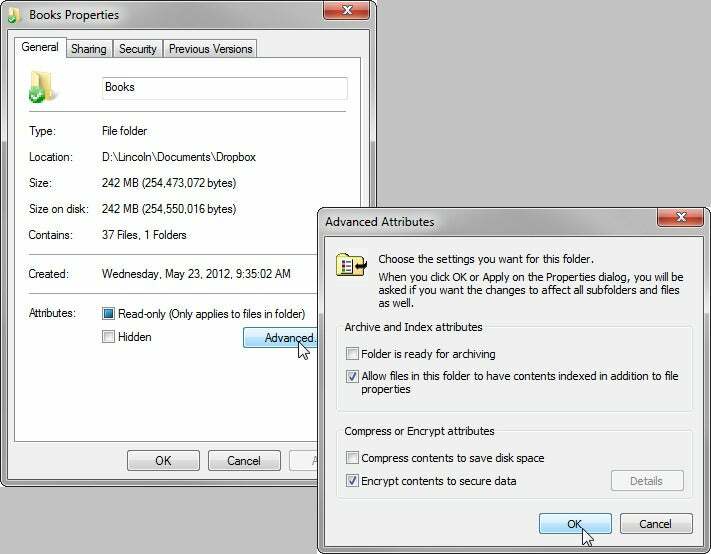 When you close out the Properties dialog box, keep Apply changes to this folder, subfolders, and files. This will encrypt every file in this folder and its subfolders. New files created or dragged here will also get encrypted. Other people will be able to see the files and the file names, but they won’t be able to open the files. Only you—or at least, only someone logged on as you—can open these files. EFS’s way of handling encryption makes a lot of sense in an office environment, where you can assume you’ve got an organized and knowledgeable IT department, but you can’t assume that employees understand the word encryption. When the user is logged on, the files appear to be unencrypted; otherwise, they can’t be read. But someone, probably IT, needs to know where the special, generated encryption key is kept—elsewhere in the office—in case Windows has to be reinstalled or the data transferred elsewhere. No wonder Microsoft keeps this out of the hands of Home edition users. Instead, I’m recommending VeraCrypt, a free, open-source fork of the gone and much-missed TrueCrypt. This version was created and is being maintained by French security consultant Mounir Idrassi. If you’re familiar with TrueCrypt, you’ll be right at home. Its simple (if unattractive) user interface is almost identical to the earlier program's. 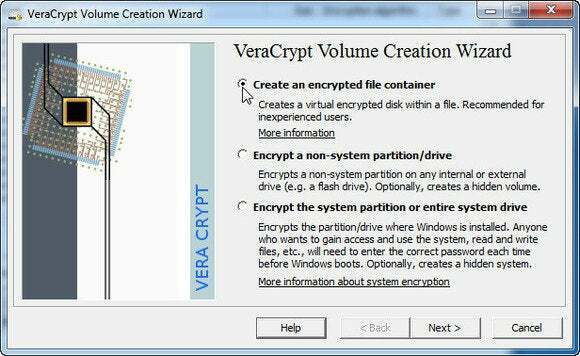 Like TrueCrypt, you can create an encrypted file container, or encrypt a partition or your entire drive. You can hide a container (VeraCrypt calls them volumes) inside another file if you like. The collapse of TrueCrypt has left a lot of us feeling shaken. I can’t promise that if the NSA really wanted to get to your files, they couldn’t crack VeraCrypt—or EFS. But if you’re worried about a typical hacker—or of the NSA sucking up your data along with everyone else’s—I think you’d be safe with either of these.